Welcome to University Leadership and Management! 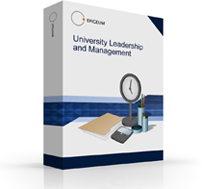 "Leading and managing groups, departments, and whole institutions, in contemporary higher education is a daunting task. There are many conflicting influences that swirl around the individuals chosen for and choosing these roles, from outside as well as inside the enterprise. The six courses that make up the programme in University Leadership and Management are carefully designed to help you to understand as well as to respond personally and professionally to these challenges." "Good leadership and management are critical to the success of today’s complex institutions, but heads of departments or research teams are often given little or no training for their administrative responsibilities. These new online courses, developed specifically for academic professionals, will help program heads to make their units more collaborative and creative, to manage resources to better serve their colleagues, and to contribute to the success of their institutions."